As a nation, we eat poor-quality foods that have been stripped of nutrients. We do not consume enough fresh fruits and vegetables. Many of us get our whole grains from instant rice, refined wheat breads, pastas, and cereal. We eat a tremendous amount of prepackaged, pre-made meals. One-quarter of Americans eat at fast food restaurants each day. Americans are overfed and undernourished. Our whole food supplements can fill that nutritional gap your body needs. Many whole food supplements available in today’s marketplace range in quality. Companies are riding the wave of supplement popularity rather than focusing on commitment and quality. Dr. Jamie offers dietary advise along with supplementation from Standard Process. 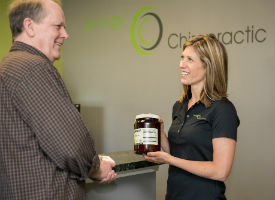 Contact Synergy Chiropractic today to make an appointment.